maggi noodle recipes. Maggi is a popular instant noodle accompanied with a packet of flavoring (known as tastemaker). It is very simple to prepare and is a famous bachelor meal. It is easy to store, has a pretty long shelf life so, you can carry it while travelling because all you would need is water to cook it quickly. Days when you have a tiring day at work, Maggi acts like a comfort food for working couples. Plain Maggi noodles or one with a sprinkle of grated cheese or dash of finely chopped green chilly is the simplest way to enhance its flavor. Everyone has their own versions of transforming these instant noodles. You can even enhance it by adding a myriad of colorful vegetables to make Vegetable Maggi. You can also pack it in a tiffin box for your kid’s lunch break. Masala Maggi is a zesty version of our classic noodles. It is made by adding a hint of spices and an array of crunchy vegetables which makes it a sumptuous meal. You can serve this tongue-tickling recipe on game nights and movie marathon days. Egg lovers can add a beaten egg or cook a Maggi Veg Omelette by combining cooked noodles with besan, rava and an assortment of veggies and sprouts. Both these alternatives increase the health quotient of the dish. Maggi is also an excellent base for snacks. You can make open toast, pakoda, finger foods like bread rolls using Maggi. Toss Maggi with a hint of oregano, chili flakes and cheese & spread it over toasted bread slice and tasty Open Cheese and Herb Maggi Sandwich is ready! Also, you can cook a bean topping and make this unique Maggi and Baked Beans On Crackers for your next party. We are sure this quick and easy recipe will be on your go-to party food lists. Substitute puffed rice with pan-roasted Maggi to make this exciting recipe Maggi Bhel. The different flavors and textures are a delight for the palate. With just a handful of ingredients Herbed Maggi Fritters, Vegetable Maggi Cutlets with their crunchy texture will become a huge success, provided you serve them immediately on preparation. You can even try your hands on deep-fried Cheesy Maggi Rolls. A scrumptious starter made by stuffing a mixture of Maggi noodles, cheese and veggies in samosa pattis, resulting in a toothsome snack, which you will literally enjoy – to the core! I am a huge fan of Maggi and all things Maggi. 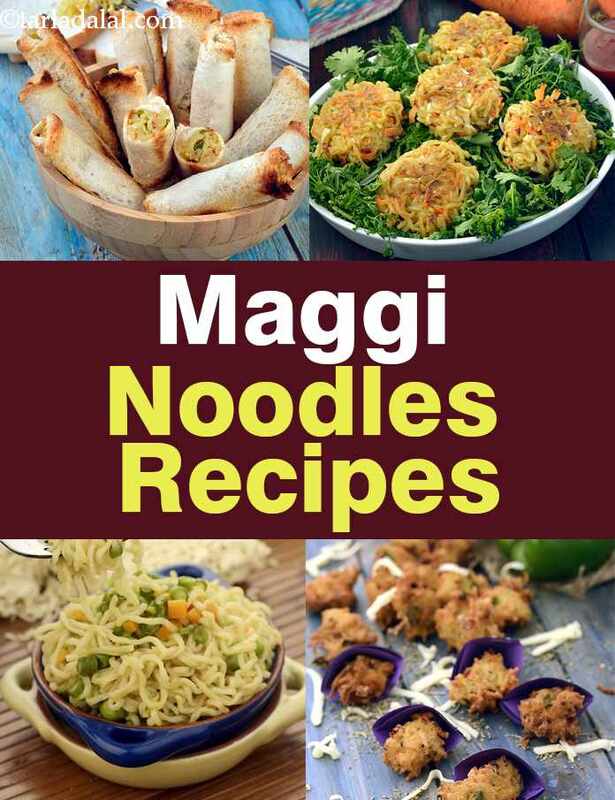 Hope you enjoyed our collection of 31 Maggi noodles Indian recipes which will help you satiate all sorts of Maggi cravings. Bread noodle toast offer the winning combination of noodle and grated cheese on bread slices. Toast the noodles and cheese filing sandwiches and relish crispy hot with ketchup or chutney as breakfast or packed lunch. Spaghetti masala brings forth an Indian style variation to the Italian favorite spaghetti recipe. The boiled noodles or spaghetti are stir fried with Indian masalas and vegetables and served as meal or snack. An innovative pakoda or snack recipe with the all time favorite maggi noodles, maggi pakoda is simply amazing when served with ketchup or chilli sauce. An appealing and crunchy salad recipe, purple cabbage salad is loaded with disease fighting antioxidants and a great fresh taste. A collective blend of awesome textures, appealing looks and great flavor, purple cabbage salad is easy to prepare and quite healthy. Southy noodles is one of the most interesting fusion recipes. The boiled noodles are cooked in typical traditional South Indian style of cooking with mustard seeds, curry leaves, grated coconut and red chillies. An unique bhajia or pakoda recipe, Noodels bhajia ids prepared by deep frying gram flour coated noodles in hot oil. Serve this delicious crispy bhajia recipe with schezuan sauce. -the chilli paste can be prepared before hand and stored in the refrigrator.it can be used as a spicy sauce with any rice dish by adding little bit of salt. An interesting combination of coriander leaves and rice in coriander pulao create an aromatic main course. A delicious chawal recipe loved by all. Try out this Healthy pizza dosa which can be put on the table in a jiffy and has the healthy combination of dosa batter with baby corn, capsicum, and tomatoes. Enjoy the freshly prepared unique Open noodle sandwich by cooking the noodles first and then placing it on the top of bread slices along with chillies. Add a generous dose of grated cheese and bake this delightful sandwich recipe till the cheese melts. Irrestible and quick vegetable pulao recipe. Ideal main course rice dish with mixed vegetables and fragrant spices. Very healthy soup for all types of ages.It is containing many veggetables with maggi noodles and pasta liked by children and olders as well.